Motivating students to read during vacation can sometimes be a challenge. 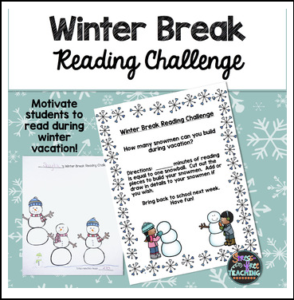 Why not challenge students to see how many snowmen they can build over vacation while reading? X minutes of reading = one part of a snowman. Students cut out and glue the snowball body parts onto the page. Optional details can be added to completed snowmen. Hats, scarves, carrots, and arms that can be used to decorate each snowman. Black and white or color images – Print only the pages you want.